CPS Energy's rate formula must be "fair, equitable and reasonable"
CPS Energy, like all utilities, sorts customers into rate categories based on how much, and how, they use power. Members of the San Antonio City Council, in response to CEO Doyle Beneby’s initial presentation on the rationale for a 4.75 percent rate increase request, asked for more information on how electric rates and rate categories are designed, and whether they’re fair – whether each category covers its own costs without subsidizing another category. Creating these categories, and determining how much each should pay, comes from a complicated set of calculations governed by a web of federal, state and local rules that have been “legislated, litigated or codified,” says Paul Escamilla, an analyst in CPS Energy’s Regulatory department . The utility’s overall charge is to make sure rates are “fair, equitable and reasonable,” Escamilla says. Establishing “fair, equitable and reasonable” rates includes these goals. Unlike a for-profit utility, CPS Energy may not recover more than its costs, but it also, by law, may not recover less — rates must be designed to recover the costs to serve each customer group. At CPS Energy, those include: operations and maintenance, debt service, the “repair and replacement” fund and payment to the city of San Antonio, which is up to 14 percent of gross revenues. At CPS Energy, classes include residential, commercial and industrial customers, plus very small groups consisting of streetlights, traffic lights and all-night security lights. Residential customers make up almost 90 percent of CPS Energy’s customer base, with an estimated 648,000 meters, but make up just 44 percent of annual usage, and contribute almost one-half of annual revenues. The roughly 71,000 commercial customers served by CPS Energy make up 10 percent of customers, 22 percent of annual usage and contribute the same percentage in revenue. Industrial customers make up less than one percent of customers — there are about 2,450 — but use 33 percent of all the power produced, and contribute 27 percent to annual revenue. They’re broken up into subcategories of small, medium and large — only about 30 industrial customers fall into this largest category of user. 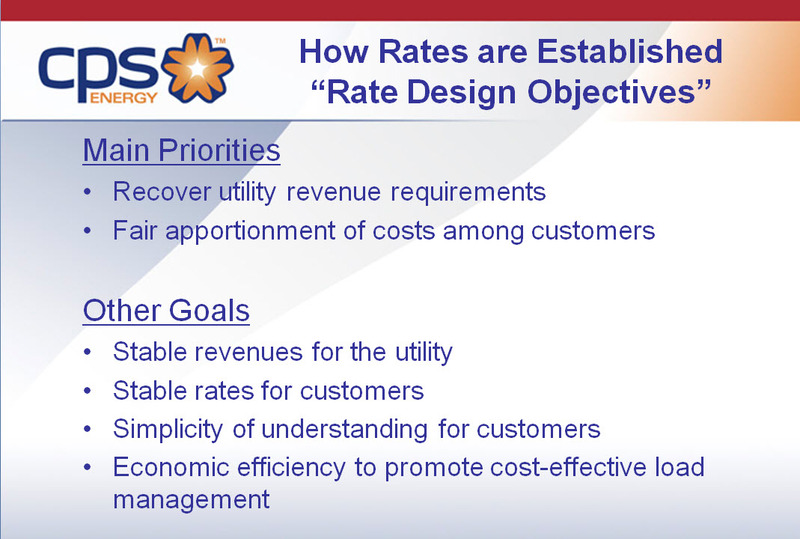 When designing rates, CPS Energy performs a comprehensive “cost of service” study consistent with industry standards. For each type of customers, it asks, what are the cost drivers for the category? One major factor is measuring how a customer uses energy over time, or what the kilowatt hours a customer actually uses versus the kilowatt hours a customer would have used at her maximum demand over the entire period. For example, a residential customer needs a lot of power when she comes home at 5 p.m. on a hot July day. She cranks up the a/c, starts dinner and puts a load of laundry in while the kids watch TV or play computer games. CPS Energy’s electrical system must be built to handle the maximum demands placed on it. Customer energy use is greatest on the hottest summer afternoons. 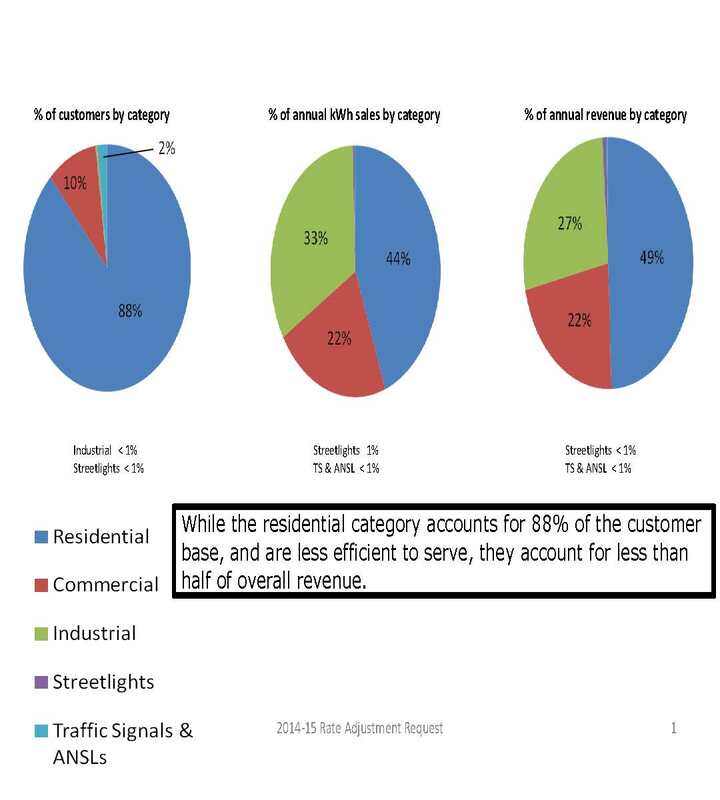 Residential customers, as a category, use a greater portion of their energy than do the commercial and industrial category of users. Industrial and commercial customers use of power is more stable over time, which means they are using power more efficiently. 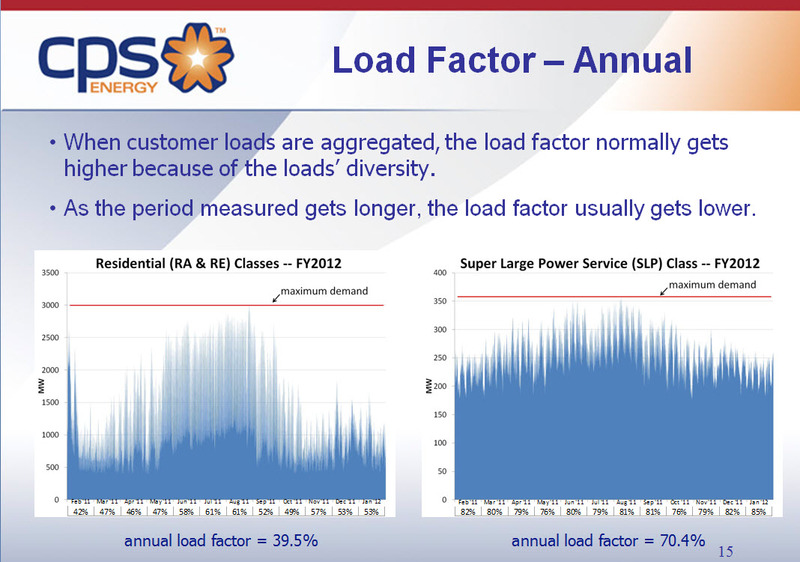 The use of power over time is how electric utilities define “load factor.” The higher the load factor, the more efficient that customer is in using power. The white space represents inefficiency — the difference between the power CPS Energy must generate and what the customer uses. 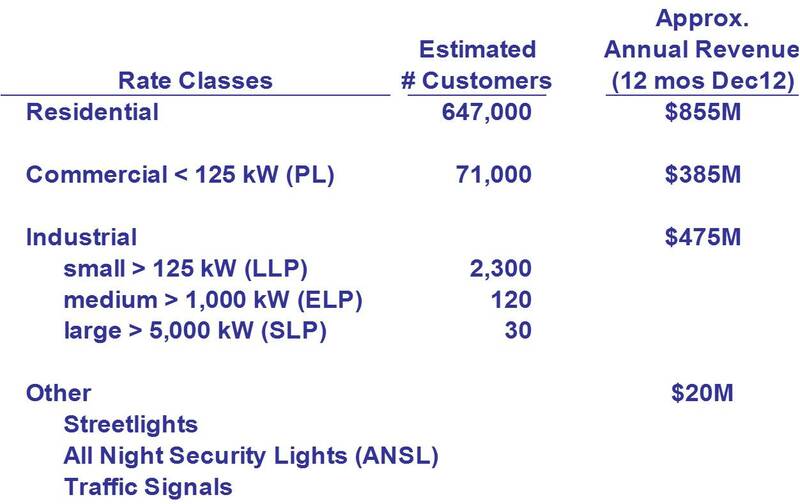 Part of CPS Energy’s mandate when designing rates is to promote cost-effective load management. Industrial and commercial customers use power in bulk, which is more efficient, because it means that the fixed costs of serving those customers can be spread over more kilowatt hours, so the unit price is a little lower. It’s analogous to carpooling: the cost for one person to drive to work might be $10, but if four people share the ride it would be $2.50 per person. It’s important to keep in mind that even with the increase, CPS Energy’s rates will remain among the lowest in Texas and the lowest among the largest cities in the country.